View our online, searchable database of all the school rankings. 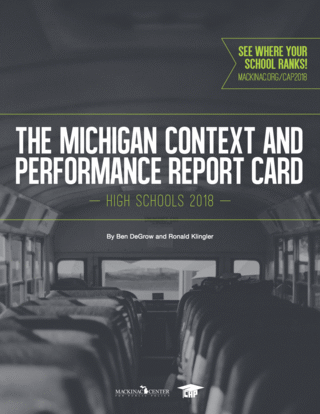 The 2018 Michigan Public High School Context and Performance Report Card is the fourth edition in a series of analyses designed to measure high school performance. The first report was published in 2012 and was followed by analyses in 2014 and 2016. This report is a school-level assessment of academic performance based on a four-year average of state standardized tests. This report card is unique in that it takes into consideration the socioeconomic status of students when assessing an individual school’s performance. The goal of this report card is to better inform the debate around relative school effectiveness and to provide parents, educators and school leaders with a more accurate picture of school performance. This report includes a brief explanation of the data and methodology used to rank schools, as well as more statistical information in adjoining appendices. Selected results are also presented, including the best- and worst-performing high schools in the state according to this analysis. Finally, this report card includes a full list of all the results for every public high school, including their letter grade and statewide percentile rank.